Jimmy Anderson concedes he never expected to become England's highest wicket-taker when he first started playing international cricket. Anderson surpassed Sir Ian Botham's total of 528 in all formats when he dismissed BJ Watling in England's defeat by New Zealand on Sunday. The bowler, 30, told BBC Radio 5 live: "It gives me a huge amount of pride. "When I started playing for England I never dreamed of getting anywhere near this number of wickets." Anderson made his international debut in a one-day game against Australia at Melbourne in December 2002 despite having played just five times for Lancashire. But his early England career has not always run smoothly with Anderson in and out of the side and then restricted by a knee injury and a stress fracture of his back. He said: "The first half of my career was up and down with injuries and lack of form and stuff like that. "It has not all been plain sailing so I am delighted things have finished well at the minute and hopefully I can continue on for a number of years." The Burnley-born bowler believes the turning point came when he was recalled to the side by then coach Peter Moores for a Test against New Zealand in Wellington in March 2008. He added: "Last time we were here in 2008 for the second Test, Stuart Broad and me came in for Steve Harmison and Matthew Hoggard and that was a real show of faith from the coach. "It gave me a lot of confidence and responsibility. When a coach shows you that it can spur you on and that is what it did for me." Botham is keen to see Anderson continue leading the attack and take his crown as England's leading Test wicket-taker. 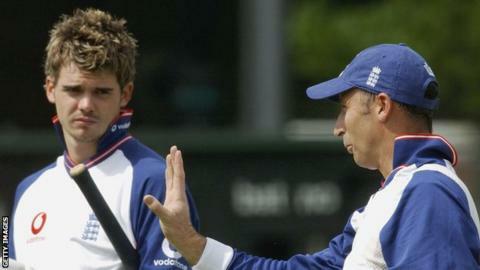 He told the Daily Mirror: "I want Anderson to break my record of 383 Test wickets for England. I've held it for more than 20 years, so I've had a good run. "But records are there to be broken, and if Jimmy - who has 288 Test wickets to date - can find another 100 in his locker, I will be the first to buy him a drink." But Anderson is refusing to set himself the target of passing Botham's record Test haul. "I would like to do it but it is not something I think about day-to-day," he added. "The reason I got here is by concentrating on the small things. "I will concentrate on the spells that I bowl, each ball I bowl and concentrate on wickets and how I take wickets. "Since I started doing that the wickets have been taking care of themselves. "Hopefully I can look back at the end of my career at a couple of records and I can look back really fondly - but for now I will just concentrate on bowling well for England."